CONCORD, Calif. (KGO) -- The nation's oldest park ranger was awarded a Congressional Record statement at the museum and national historic park where she works. 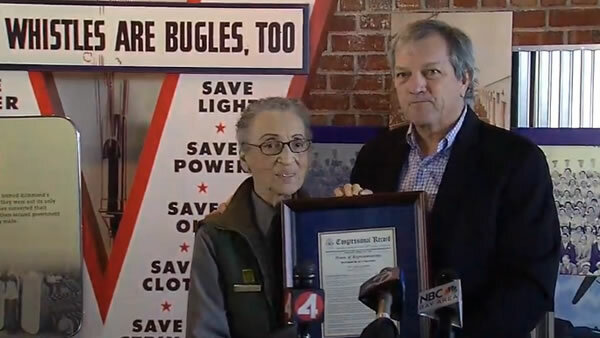 Rep. Mark DeSaulnier presented 95-year-old Betty Reid Soskin with the statement at the Rosie the Riveter/WWII Home Front National Historic Park in Richmond on Friday. The Congressional Record is the official record of the United States Congress and has been published daily since 1873. The award is one of a long list of honors Soskin has received. In 1995, she was named California Woman of the Year. Last Christmas she received a presidential coin from President Obama after she lit the National Christmas tree at the White House. That coin was stolen from her home in June in a brutal home invasion robbery. She recovered and returned to work just weeks after the attack.